During a recent visit to the grove in January, one of our trees was already blooming. I was shocked because no other trees on the property were blooming and wondered if it was a fluke caused by a combination of the drought and hot weather we’d been experiencing. But upon further research, I learned it is possible for Hass trees to start blooming as early as January. Although the typical bloom season is from late March to early May, timing can vary greatly depending on location in the grove. This particular tree had the trifecta going for it: located in a warmer area of the grove adjacent to a road where more light and heat from the asphalt kick starts things to action, at the top of the hill on the southwestern edge of the property where it receives long exposure to sun in the afternoon, and just behind some other trees that provide some nice windbreak from the west. Mystery solved. Nearly every branch on our early bloomer seemed to end in a cluster of buds and flowers similar to the picture above. One tree can blossom with up to a million flowers a year (really! ), but usually produce between 100 (5,000 lbs. per acre) and 500 avocados (25,000 lbs. per acre) a year (Bender). So the next mystery was how to get them to bear more fruit (closer to the 500 range would be nice! ), which led to some sleuthing on the flower structure. Although it’s not the most beautiful flower in the world, it is definitely the most curious. Each avocado flower has both male and female organs, but they function at different times. When it first opens, the flower is female, its stigma receptive to pollen, but its stamens do not shed pollen (Bergh 1974). The flower will stay open for several hours, then close overnight. The next day it will re-open as a male! The stigma no longer accepts pollen, but the stamens now shed. The picture above shows all the flowers in the female stage (the white anthers of laying flat against the petals and are not releasing pollen). The flower in the middle of the cluster looks like it is just opening. If I had returned to the same flowers the next day, all the anthers would have been erected, close to the stigma and split opened to release pollen. Here is San Diego, the main mode of pollen transfer is via honeybees. We have a cover crop of flowers to attract bees to the property. Fascinating research abounds on bees; I’ll have to save that for a later post. 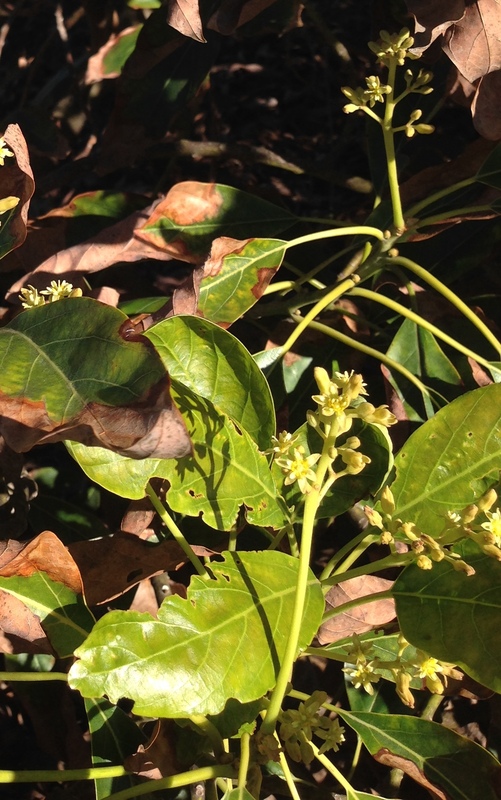 Besides pollinators, avocado trees can cross-pollinate (pollen transfer between different cultivars), close-pollinate (pollen transfer within same tree through branches touching, wind), or very rarely, self-pollinate (same flower). The idea of cross-pollination is intriguing because it involves planting a cultivar that operates on a different “sexual clock” than Hass trees. Hass trees are “Type A”, meaning the flower opens as a female in the morning of the first day and then reopens as a male in the afternoon of the second day. “Type B” cultivars’ flowers open as a female the afternoon of the first day, and then reopen as male flowers the morning of the second day. Below are some tables (borrowed from Bergh) to show how this works to allow male and female flowering stages to overlap. Before we removed and stumped many of our trees, we had a few Fuerte cultivars (which are Type B) interspersed through the grove. We may still have some down in the ravine. The research has not sold me that it really helps increase yield. Plus, the Type B crops are not as marketable. The UC breeding program is currently researching development of Type B cultivars (Marvel and Nobel) with Hass-like properties. We will probably plant a few Type B trees in the future, but I think we will depend more heavily on attracting bees to the property. So eventually adding some hives along with our cover crop is in the plan. I’ve always wanted to have an apiary for honey production. The early blooming tree on our property was thankfully swarming with bees doing their magic! As for most of our other remaining, non-stumped trees, they are located down a ravine with southeastern exposure. They looked pretty far from blooming, so I’d expect them to start the usual time in March. If you are curious, there are all sorts of factors that affect bloom, such as age, phenology, temperature, day length, water stress, and whether it is an “on year” or an “off year”. Avocado trees have “on” years when crops are very heavy and “off” years when there is little or even no crop. If you want to learn more about these factors and how they affect flowering, you can find more in Dr. Gary Bender’s work. Photos taken by Julie Ogilvie. Bender, Gary S. Avocado Production in California. University of California Cooperative Extension, San Diego County. Book 1. Chapter 3. Available at: http://ucanr.edu/sites/alternativefruits/Avocados/Literature/. Bergh, B.O. 1974. The Remarkable Avocado Flower. California Avocado Society Yearbook. 57: 40-41. 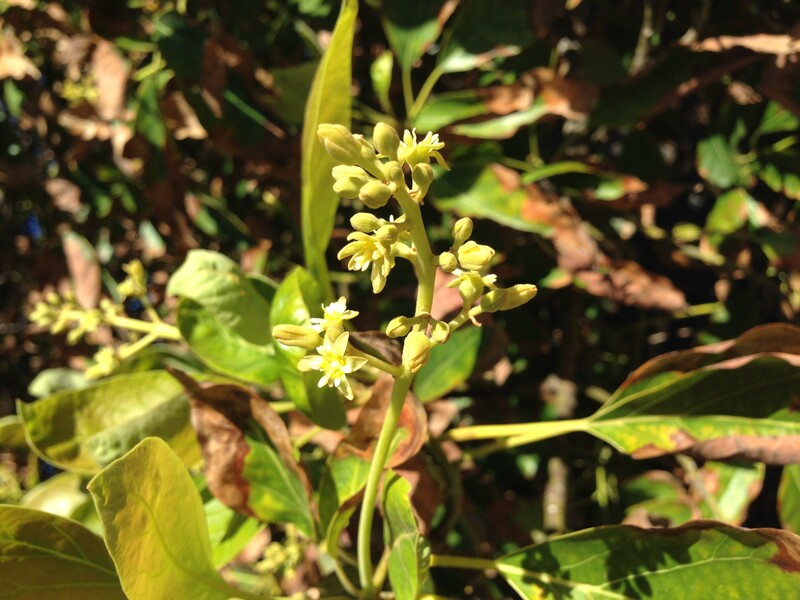 This entry was posted in Avocado Farming and tagged avocado, avocado bloom season, avocado farming, avocado flower, avocado tree, cross-pollination, Fuerte, Hass, honeybees, Marvel, Nobel, pollination, yield. Bookmark the permalink.